Due to technical difficulties the news letter that should have come on January 7 didn't get sent so you will be receiving both the newsletters for Jan. 7 and Jan 21. We have completed our yearly collection for Christmas for Coho which was successful not only with the tree collection but also with the weather. At the Northwest Fly Fishing Outfitters we collect 134 trees and at the Old Fire station we collected 136 trees for a grand total of 270 trees. Thank you for all of our volunteers who helped with tree collection and moving the tree to the put in site. Few fishing opportunities get me as excited as hitting a lake in the height of the damselfy season - hoards of blue bombers flitting about, and pods of fish eagerly awaiting a shot at them. The takes are sudden and slashing. Over the years I've tried a number of different commercial and self-tied patterns, of all kinds of materials, with mixed results. Some that look great don't stand up, some with great materials don't get much attention from the finny customers. At some point, I started paying a bit more attention and began to notice a few things. Though adult damsels show in several colors, the predominant specie is a dark electric blue shade - to my eyes, a bit darker than the braided synthetic body material available in most fly shops. And when an adult damsel does hit the water, it generally presents a flat (not an upright) target, most often with wings splayed. The commercial patterns tend to be overhackled like a typical dry fly, sitting the fly too high on the surface for a realistic presentation. I also noticed that the braided synthetic body often looked thoroughly chewed after several takes. 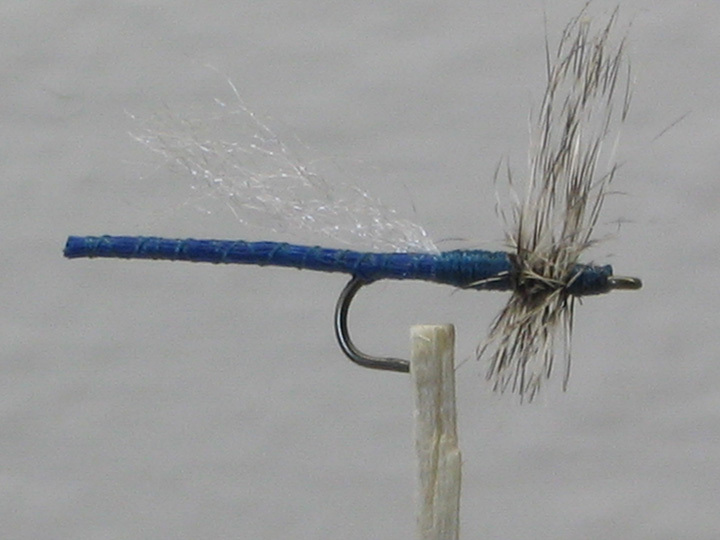 To overcome those hurdles I use a simple pattern of dark blue bucktail and trimmed, "softer" grizzly hackle. 1. Secure the thread about halfway between the hook eye and bend. 2. Cut a small bunch of bucktail fibers (about 16-20) from the bucktail near the buckskin - generally they are three or more inches long. 3. Secure the bucktail to the hook (trying to keep the fibers on the top of the hook) by close, fairly tight wraps back to the beginning of the bend of the hook. 4. Holding the bunch of bucktail sticking out the back of the hook with your left hand, continue wrapping the thread toward your "holding hand", in fairly tight spirals at about a 30 degree angle (so as not to hide too much of the bucktail material by the thread) about one inch beyond the start of the bend of the hook. 5. At that point, wrap two more turns perpendicular to the bucktail (to "finish" the end of the fly's body) and spiral the thread back to the hook bend, in the same manner. Trim off the excess bucktail just past the "finish" wraps, and gently pull the tail straight. 6. Continue wrapping the thread to about a quarter of an inch from the eye (to leave room for the hackle and head). 7. By wrapping thread back and forth closely together, build up a noticeable thorax about three-sixteenths of an inch long with the front ending about a quarter inch from the eye. The thorax should be about twice as thick as the body. 8. Take a grizzly saddle hackle with splines about three-quarters of an inch to one inch, attach to the hook at the front end of the thorax and make about six turns; tie off and finish the head. This is key: to make the damselfly durable, I coat the entire body and thorax with Fleximent (I thin the Fleximent a bit with Fleximent Thinner to get a good thin coat and good penetration of the thread/bucktail body). I tried doing it after adding the hackle and finishing the fly but it's too difficult to avoid the hackle and still get good coverage. So I tie these flies in two stages: after I finish the thorax (step 7), I lash off the thread with two half-hitches where the hackle later with be placed, cut the thread, stick the hooks into my ever-present wine corks (you know where to obtain these), coat the bodies and let them dry, and then re-vise and add hackle. And finally, to make the flies lie how in the water, while the fly is in the vise I trim the bottom of the hackle squared off even with the tip of the hook. Make no mistake, this is a tried and true pattern. The Fleximent body holds up extremely well, and the somewhat softer saddle hackle and body take fly dressing well to keep it afloat yet low in the surface. In fact, one well-known fly shop in Maupin has added the pattern to its arsenal after I demonstrated its lethality to the owners in some private lakes they manage. The damselfly hatch usually develops on most lakes in mid to late May, as the weather warms and sunlight increase. Typically during the first few days you'll see increasing numbers of subadults (tannish in color) flying around on shore near the shoreline and over shore edge reedbeds. A few more days and you'll begin to see squadrons of blue adults venturing out over the lake, primarily near the edges, and the fish begin to look up and drool. At that point, gear up! Last summer, I worked one end of a lake for about two hours, hooking up about a dozen and a half times, and getting dizzy while fish after sizeable fish turned me round and round in my tube before coming to new. I doubt if I had several minutes at most between hookups. My hat's off to the lady! The Deschutes River Alliance (DRA) is a nonprofit, science-based advocacy organization working to protect and restore the health of the lower Deschutes River. Since its founding in 2013, DRA's robust science program has documented multiple changes in the lower Deschutes, all coinciding with implementation of a new "Selective Water Withdrawal" at Round Butte Dam. These changes include new proliferation of nuisance algae, warmer water temperatures during the spring and summer months, and significant changes in aquatic insect populations and hatch timing. These developments, in turn, have led to impacts to the river's treasured fish populations and flyfishing experience, to birds and other wildlife, and to the economy of north Central Oregon. DRA's science program forms the basis of its outreach and advocacy efforts as DRA seeks to inform the public and advocate forcefully for the protection of this remarkable river. On February 13, representatives from DRA will provide updates on the organization's ongoing science and advocacy work, and look ahead to planned efforts in 2019 and beyond.